As a food writer who researches the sources of what we eat, I frequently encounter both purveyors and buyers who bemoan the disconnect between source and consumer that is so common today. Not only are we no longer a rural society, we hardly even know what rural means anymore. Plus, with food brought in from Chile or China as often as from a nearby farm, that disconnect with the food source grows. There are, of course, many who are fighting this trend–and, in fact, fighting this trend is becoming a trend itself. Farmers offer tours of their facilities. Community Supported Agriculture offers an opportunity for city slickers to dig in the dirt. At farmers’ markets, people can actually talk to the people who grew the food they’re about to buy. And now, people are beginning to consider ways they can become part of the supply chain. Urban farmers are digging up small backyards to create lush vegetable gardens. Rooftops sprout greenery and greenhouses. And now, in some places, cities are beginning to allow people to have a few chickens in the back yard. Nice to think of actually having a really fresh egg from time to time. And, unlike a dog, you don’t have to walk a chicken. But what do you have to do, and where do you go, if you do want to learn more about raising chickens? Of course, researching it on your own is a possibility. The information is out there. But if you’re pressed for time and want to take advantage of the accumulated expertise of someone who has been thinking about all these things for many years, you could hire someone like Jennifer Murtoff. Jennifer is an Urban Chicken Consultant. Based in the metro-Chicago area, she has a wide range of neighborhoods and cityscapes that have benefited from her expertise. 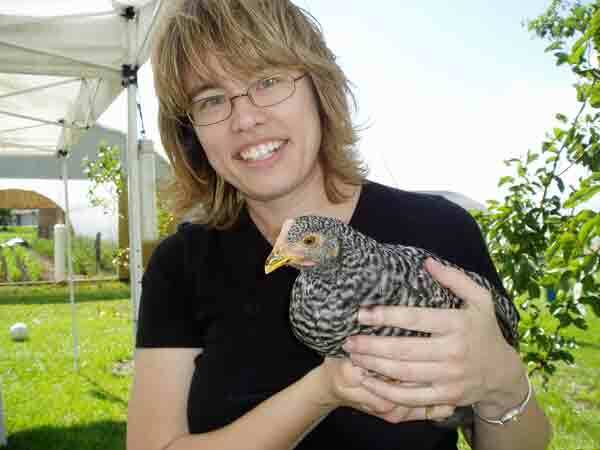 From presentations to groups to private guidance in how to establish your own coop full of chicks, Jennifer makes it her business to share the ins and outs of raising, feeding, and benefiting from your own hens. If you’d like to learn more about Jennifer’s business, along with a wealth of information and tips for those already involved in raising chickens, you can check out her blog, Home To Roost. It’s fun and encouraging to see people taking an interest in learning about food production. As Jennifer notes, a few chickens in the backyard won’t be enough to keep you from ever going to the store for eggs again, but there’s something about having your own eggs from your own hens that makes those eggs just a little more special. Oh — and if chickens are just a bit too ambitious for you, ask Jennifer about quail. They can make a nice addition to the family, as well.